Piazza di Spagna is situated in front of the Spanish Steps. In the past the Spanish Embassy was housed in Palazzo di Spagna at the square. 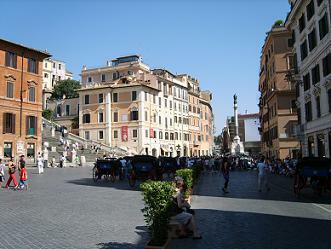 The name of the square was changed from ‘Piazza della Trinita’ to ‘Piazza di Spagna’. A church named ‘Trinita dei Monti’ is located at the top of the steps. The shape of the Piazza di Spagna is remarkable, it is a triangle. 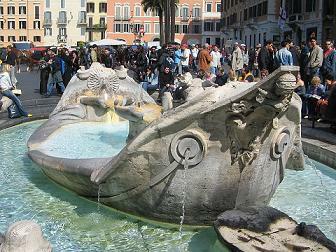 Opposite the stairs is a fountain, La Fontana della Baracaccia (Fountain of the Old Boat). The fountain is made very low, under the street level, and has a small flat boat in it. In the 16th century, a flood of the Tiber river had hit Rome. Metro station Spagna is on top of the Spanish steps. Nearby is Villa Borghese. This is a nice park with a the Galleria Borghese. In this small museum are paintings from world famous artists as Titan, Caravaggio, Bernini and Rubens.